With the CryptoCape soon to release, I’ve been trying to finish the Linux driver for the ATECC108. 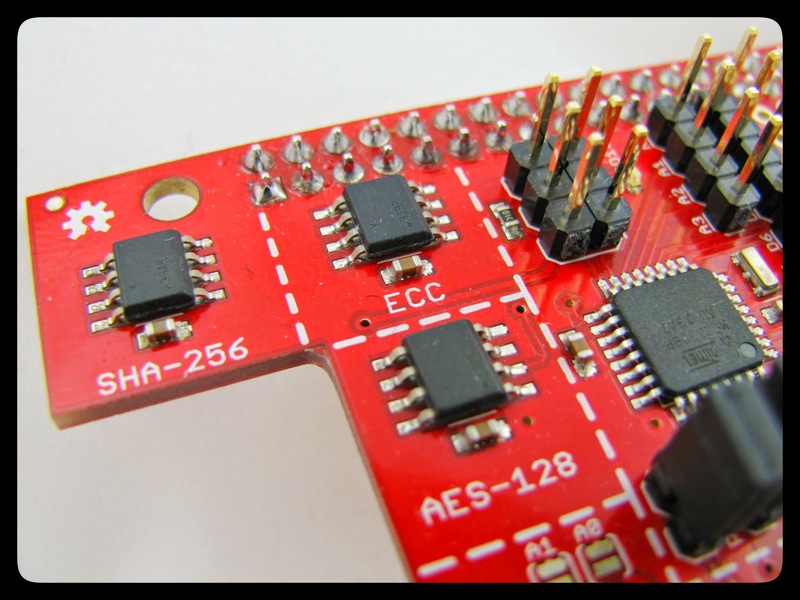 The ATECC108 is an Atmel crypto chip that signs and verifies data using ECDSA signatures. By “driver” I mean a user-space command-line interface (CLI) application, like the one I previously completed for the ATSHA204. The ECC108 on the CryptoCape is between the ATSHA204 (SHA-256) and the ATAES132 (AES-128). Atmel releases a very complete AVR based library for this chip, which doesn’t help too much under Linux. It took much longer than I expected, but I have a working snapshot of software, now on GitHub, which I’m calling EClet1. It’s not a release yet, so I’m considering it be in alpha, but it seems to work so far, with one exception discussed below. The purpose of this device is to produce and verify digital signatures. In this post, I’ll walk you through an example work flow of the device. I’ll highlight what is working and where there are issues. First of all, why would you want to use this chip on the BeagleBone? Let’s say your BeagleBone is acting as web server, using HTTPS. You could store your private key in software on the BeagleBone, but in the case of a software vulnerability, you could leak this private key. If the key is in hardware, it is much harder to leak. I say harder and not impossible because well, security is nuanced. Part of my motivation for releasing this software and building the hardware is to allow security researchers an easier interface to these embedded devices. AFAIK, there is no way to extract the private key from the device. With the disclaimers out of the way, let’s walk through how to use the software. First of all, the software must be installed. There are two pieces, the eclet driver and the corresponding library: libcrypti2c. Then run the ./autogen.sh script. This will download and install libcrypti2c. This command ensures that the ECC108 is uninitialized. Once you run the next command, personalize, it CAN’T be undone. This is by design. The software is in alpha and is subject to change. If something goes wrong or if a feature is added later on that is incompatible with your now personalized device, the only thing you can do is physically remove the chip and re-solder a new one. You can always stop by the #cryptotronix channel on Freenode and ask me (jbdatko) about the status of the software and whether it will meet your needs at the moment. A successful personalization will silently complete. Unlike the hashlet driver, this does not load keys. That is performed in the next step. By the way, documentation is available by running the --help command as well. The default slot is slot 0, which is the same as specifying -k 0. The signature is the raw . There is an open issue with the sign command, but I think I have it mostly resolved. offline-verify-sign is the one that uses software, specifically libgcrypt. Both versions silently complete on success. 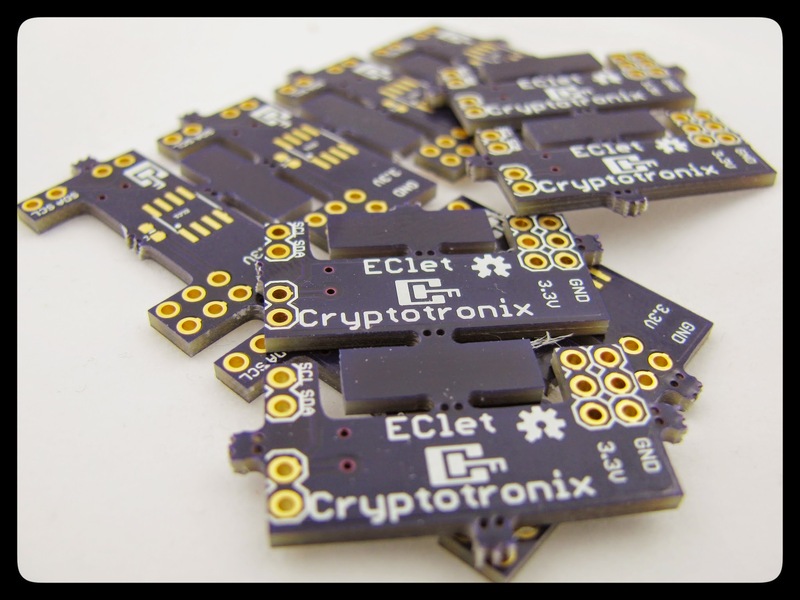 EClet boards, not yet available. I added a bypass cap on this design and a cutout so it looks like a “C” (and allows you to use the P9 header). That should get you started with the eclet software and the ATECC108.